Never one to throw anything away, related to food that I could possibly use in another way, this is how the potato rolls started. I had a couple of baked potatoes looking at me from the bench for a day….and I knew there had to be an answer…admitedly I had heard of potato bread before and in fact I think there is a way to use potatoes as yeast, but that is another day and another recipe! I used the multi loaf tin, cos they looked so darn cute…but you can hand form the dough into any shape you want. Brush with a little melted butter when they come out and voila, great for a dinner party, nice as a sandwich, toasted…you know the drill! Place yeast, egg, milk, sugar and butter into Thermomix bowl and warm for 2 min 37ºC/speed 3. Add all remaining ingredients and blend for 12 sec/speed 6. Wrap tightly in Silpat mat and allow to double in a draft free place. Roll equal sized balls depending on your tin. 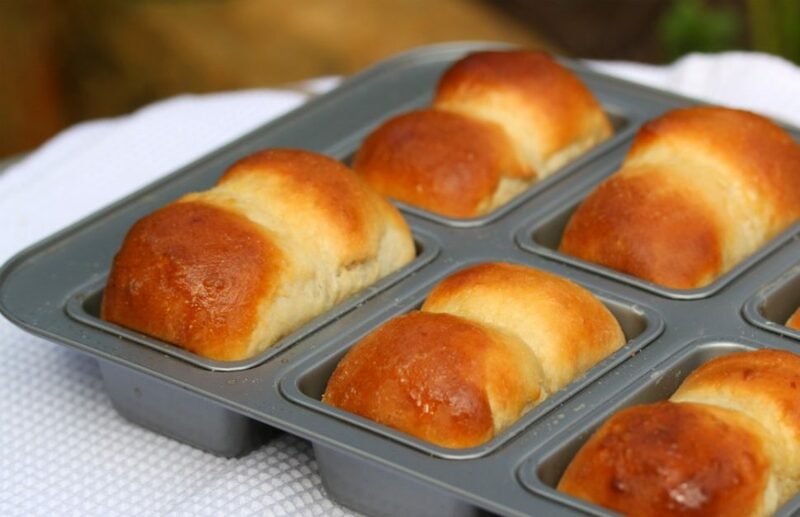 Place 2 balls per mini loaf hole and allow them to rise until joined and reaching the top of the the tin. Bake for 10-15 minutes or until golden. Brush with a little melted butter when removed from the oven and whilst still hot. EAT….piping hot if possible…with lashings of butter and possibly home made Vanilla Strawberry Jam….of course!